A new era of Olympic coverage is about to dawn on UK TV, with both the BBC and Eurosport providing coverage of the upcoming Winter Olympics. Following a surprise deal in 2015 between Eurosport's owner Discovery and the International Olympics Committee, which saw UK rights to the Olympics go to Discovery from 2022 (and most of the rest of Europe from 2018), Eurosport is sub-licensing the BBC's Olympic rights for 2018 and 2020, as part of a deal to reduce costs and to secure BBC access to the two Olympic Games under Discovery's control in 2022 and 2024. It means that the BBC will no longer carry an extended Red Button service, as viewers have been accustomed to since 2012. However, comprehensive coverage will continue across its existing TV services for next month's Pyeongchang Winter Olympics, which run from 9th February to 25th February 2018. Viewers will find daily coverage between midnight and 8:00pm across BBC One and BBC Two. 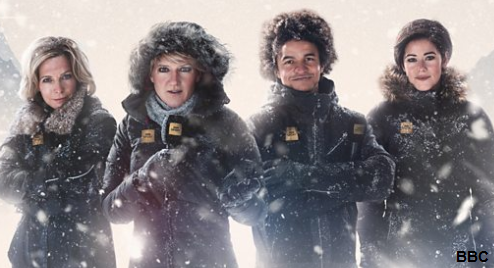 Clare Balding, Hazel Irvine, Eilidh Barbour and Radzi Chinyanganya (above) will become the faces of the live TV coverage while Radio 5 live will deliver reports and live updates with Eleanor Oldroyd and Rob Hatch. BBC Sport online will feature live video coverage of the key moments. According to the BBC, the TV schedule will ensure fans catch all their favourite moments and key highlights from the Games, alongside the latest medals table and results, with extra features, reaction and analysis from BBC reporters and talent. BBC Two will carry a daily highlights programme, bringing the best bits of the day, and will also be available on BBC iPlayer and the existing BBC Red Button service. BBC Sport online will live stream all the key moments of the Winter Olympics to desktops, tablets and mobiles and on-demand video clips will be accessible at any time via the website. With a collective reach of around 30 million, BBC Sport’s social media channels will distribute some of the best moments of the games, straight to mobile. Audiences can also use the BBC Sport app for mobile and tablet devices, available to download for free. Fans can visit BBC Sport online in advance of the Games to take a close look at each sport in the Winter Olympics, as well as the Team GB and global medal hopes. Pay TV households, plus those who subscribe to the standalone Eurosport Player will be able to access additional channels of coverage and streams via Eurosport. Really not sure about this. How is only licensing to "Pay to View" television channels a good thing for sports. I'm lucky I have Eurosport if I didn't then the live Olympics would not be viewed in my house. Catch-up is all well and good but not the same as watching live sports.